Thanksgiving is right around the corner and if you are dreading cooking your turkey maybe it’s time to try something a little different this year. There is more than one way to cook a turkey and choosing an alternative method may be just what you need to get yourself excited to make this huge holiday meal. To help get you inspired, here are tips and tricks for cooking your turkey on the grill! If you are cooking a smaller-sized bird, about 12 pounds or less, you can grill your bird rather than roasting it. In order to grill your Thanksgiving turkey you will need a large charcoal grill, about 20 pounds of charcoal briquettes, a disposable roasting pan big enough to fit the bird, a meat thermometer, a grill thermometer, utensils like tongs and heat safe gloves. Whether you are roasting, grilling, or smoking your turkey, you will want to brine it first in order to have juicy meat that is packed with flavor. Once your turkey has soaked in the brine long enough, remove it and rub the entire outside with butter. This will help create a crispy, browned skin while the turkey grills. If you want a little extra flavor, apply a dry rub (low in salt) to the outside of the turkey and put it in the pan. You might be wondering why you haven’t stuffed it yet. The easy answer is that you should not stuff turkeys that aren’t going to be roasted as the stuffing won’t cook properly or evenly and you will risk food poisoning. If you opt for one of these alternative methods, simply cook the stuffing separately in a pan in the oven. Start the grill and get the charcoal going on one side of the grill. Oil the grill’s grate and set the disposable roasting pan in the grill next to the charcoal. This will serve as the drip pan and keep the juices and fat from dripping onto the hot coals. 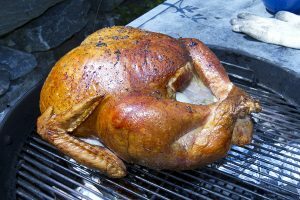 Once you have white ash on the charcoal, place the turkey on the grate so that it is positioned over the drip pan. Ideally, you want the temperature inside the grill to remain around 350 degrees Fahrenheit while the turkey is cooking. The turkey will take two to three hours to cook and you will want to rotate it while it is cooking so that it cooks evenly. Try to keep the grill closed as much as possible. The turkey is done when the meat thermometer reads 165 degrees Fahrenheit when inserted into the thigh meat. Once the meat has reached the appropriate temperature, remove the turkey from the grill and carve as you normally would. If grilling doesn’t seem like the right solution for you, you can also smoke your Thanksgiving turkey in a smoker or deep-fry it in a deep-fryer made for cooking turkey. Choosing to go outside the lines when making this year’s holiday meal can make it more interesting for you and more memorable for your guests. This entry was posted in Cooking, Holidays and tagged Fill Your Plate, Grilled Turkey, Thanksgiving, Thanksgiving Dinner, Thanksgiving Dinner ideas, Thanksgiving Turkey, Turkey, Turkey recipe. Bookmark the permalink.